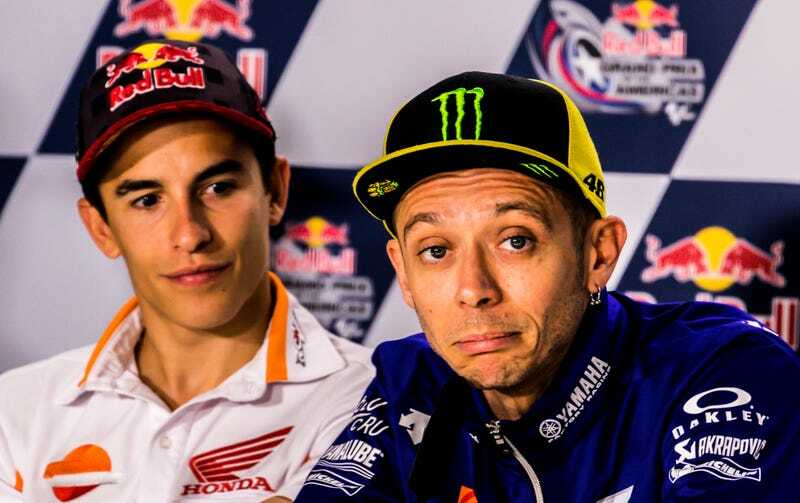 If there’s one thing that MotoGP gets absolutely right, it’s the press conference. The series picks out the best fan questions to ask during part of the conference. Fans get creative, and some of the questions are downright hilarious. If every series did this, press conferences might actually be worth watching. Most racing press conferences are pretty dry affairs. Journalists covering the series tend to ask serious questions in their outlets’ drier, more straightforward tone. The answers they get usually aren’t answers at all, but rather, pretty obvious. Everyone hopes they have the best car or bike for the weekend. The team’s been working really hard to have the best vehicle out there on the track, and they’d like to bring home a win here this weekend. Boy, that win last race/month/year/etc. was pretty awesome, and it felt great for so-and-so to be on top of the podium. You want to win? No kidding. Of course you want to win. You don’t race professionally to hope to finish in fifth place, have a mechanical failure or crash out. You’re here to win. No one at a press conference is going to give up any details that might give away too much information to competitors, or paint the team in a negative light. Thus, the juiciest of the serious interview meat is kept locked away, never to be shared with the group. But when MotoGP involves the fans in their press conferences, the questions they pick can range from the serious to the delightfully absurd. They’re hand-picked to take out any obviously terrible queries that would make a YouTube commenter blush, but the series does a good job of including straight questions about about the racing itself as well as questions that are completely out of left field. The end result of the fan Q&A not only gets the fans more involved, but also it also humanizes the drivers, who break character and laugh a bit. They seem more like normal people instead of ultra-fast, ultra-dull automatons. I don’t want to hear obvious answers to obvious questions. I absolutely want to hear about how many Marc Márquez-sized ducks you can drop-kick into the next county in the ultimate Rider Duck Battle Royale. The traditional press conference has outlived its usefulness, with too many drivers and riders who have mastered the art of saying a lot of words that divulge very little. It’s time to turn them over to the fans, who ask way more fascinating things that you can’t answer with a straight face.